Do you love quilting and not love quilting at the same time? Quilting for non-quilters, that’s what this Sewing With Nancy program is all about. Denise Abel and Nancy show you how to turn your computerized embroidery machine into a quilting machine. Denise is the embroidery and quilting expert at Nancy’s Notions. Here’s a preview of what you’ll learn on TV! The piecing of the Simple Shadow Block was stitched on a stabilizer, assuring precise piecing without precise cutting of strips. You can piece a quilt without being a quilter! Denise and Nancy developed a book with 30 embroideries, some of the embroideries are for piecing, the others for quilting! The embroideries are found on the companion CD that is included with the Stress-Free Quilting with Machine Embroidery book. Here are the specifics—it’s quite a deal! Four piecing quilt block designs: Simple Shadow blocks, Quilt Charm blocks, Fancy Squares blocks, and Crazy Quilting blocks. Six quilting designs: Leaves block, Leaves border, Flower block, Flower half, Modern Star block, and Modern Star half. 30 designs: 10 (5″ x 7″), 10 (6″ x 10″), 10 (8″ x 8″). Thread color sequence charts for each design. Amazing Designs Edit Xpress software to re-size, re-color, preview and print Amazing Designs collections. Select three fabrics: a light, medium, and dark. Cut 6-1/2″ squares of the light (white) color; then cut them in half, point to point, to create 1/2-square triangles. Stitch the first thread color directly on the stabilizer, the outline of the quilt block plus the numbers 1–3. Place the ½-square triangle of color #1 over the section marked #1—right side up. The fabric must extend beyond the stitching lines. Stitch the second thread color, which bastes down fabric #1. Align fabric strip #2 along the diagonally stitched line, right sides together. Make certain that the fabric is extending ½″ beyond the outline on the stabilizer at the upper left corner. Stitch the third thread color. Trim away the excess fabric along the previously stitched line. Align fabric strip #3 along the previously stitched diagonal line, right sides together. Make certain that the fabric is extending ½″ beyond the outline on the stabilizer at the upper left corner. Fold up fabric #3. Press from the folded edge, and work to the opposite corner. Then, stitch the next thread color, which attaches the fabric to the stabilizer along the outer edges. Stitch the final thread color. This stitching gives a cutting guideline. Trim the block. It’s the perfect size! There are more design options to piece with your embroidery unit. The best part is that each block is perfect in size! 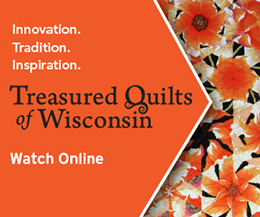 Watch Stress Free Quilting with Machine Embroidery Part One on Sewing With Nancy online. Leave us a comment sharing your most stressful step in the quilting process, and you’ll to be entered to win a copy of Stress-Free Quilting with Machine Embroidery. A winner will be chosen randomly and announced on November 22. The randomly selected winner of The Ultimate Serger Techniques Workbook is Rosie. Her comment is: Learning how to gather with a cover stitch would be my first lesson. Since I have 4 granddaughters, ruffled things are a must. This would be the best technique for me. I would truly enjoy using this book. Thanks for the opportunity to win it. Be sure to join in and follow the 2018 Nancy Zieman Productions Christmas Stocking Sewing Challenge at the NZP Blog. Piecing the tops has been a challenge for me because I’m eager to jump ahead to the fun of quilting. The Sewing with Nancy shows have always given me quick tips to make it faster and easier, though. I have had an embroidery machine for over ten years. This book might just be the jump start I need to jump into machine quilting my quilts using embroidery! I always find physically quilting my quilt to be stressful however I do find sandwiching and getting a smooth finish tricky! I have lots of tops would, be nice if I could get them quilted on my embroidery machine. Plus making a perfect quilt would be great because it is done in a great method. I find making certain that all seams align is the most stressful step in the quilting process. I enjoy selecting the fabrics and choosing the design I’ll use. While I am not a proficient quilter, I enjoy the challenging steps as they come. The whole process after piecing the quilt is stressful to me, from sandwiching and pin basting to sewing on the binding. I love machine embroidery but have never done a quilt in the hoop, and would certainly appreciate and enjoy this book. The most stressful step in the quilting process for me is the quilting itself. I have trouble selecting the design and keeping my stitches even when free motion quilting. This book would be an excellent source to help me improve my quilting skills. Thanks for the fantastic giveaway! The most stressful thing for me is making sure that all the blocks are the correct size. The only think I am not fond of about this is you do all the quilting and still have to put the backing on, but it isnt quilted. I still want to find a way to do it all in the hoop and then bind the pieces together…have seen that done too, but you have to use sashings that wind up to be 1 inch. The most stressful part of quilting is determining which quilting designs I should use. This is something I need to do today. I always hesitate to quilt because I am not able to have my points crisp, even with careful cutting and pressing. I am stressed before I start because I don’t know which design to use or I stress over puckering after I started. The whole quilting process is stressful for me. I think the most stressful part in the quilting process is sandwiching the quilt. Getting all those layers to lay flat can be a challenge! Not getting puckers in my quilt. For me it’s quilting the quilt. I would love to win. The most stressful step in the quilting process is determining how to quilt the design. I want a quilting design that will showcase the quilt. The most stressful part for me is cutting.This book would be great to win. Cutting would be easy. Thanks for the give away. Quilting the quilt is by far the most stressful part to me. I enjoy the piecing part, but rolling it up to fit through my machine, and keeping it flat and not wrinkling, is hard for me. To add stress, I just don’t feel comfortable doing the free motion quilting. The most stressful part is getting the back to lay flat while quilting and not wrinkle! For me the most stressful part is sandwiching the quilt, this would certainly take that dreaded process away. Thank you for the opportunity to win this book!!! The most stressful part of making a quilt is quilting it. By far the most stressful point of quilting is the quilting. Drawing has always been a challenge so “free style” feels so threatening! Quilt as you go helps, but it’s still a great challenge. Maybe I need to try using my embroidery unit. I have a Brother SE-400, but I have never used the embroidery part of the machine. maybe if I win this book I could quilt on it at least. Trying to decide on which quilt to make next. For me or for a relative? Then which beautiful pattern to use. My most stressful moment is quilting the quilt. I love to do the piece work but quilting sends me into a frantic frenzy. My most stressful point is quilting of my quilts. I love to piece the quilts but the quilting sends me into a frenzy. My most stressful part is trying to manipulate a large quilt on my machine. The most stressful is finishing the binding. The most challenging part is fold over machine sewing binding method, especially the corners. Now I always iron before clipping /pinning to help keep the fabric to stay as evenly as possible. Yet, I still have spots that need to be hand stitch. The stressful part is the free motion quilting. Just not sure what design stitch would be best for the overall quilt. The biggest challenge that I face with quilting is the puckering that can occur. No matter how well pinned layers are, thre seems to be shifting. Would welcome any helpful ideas! I have tried quilting with two different machines; even bought a 1/4″ foot, but I still can’t seem to get a straight 1/4″ seam that stays 1/4″. Now that I have an embroidery machine, I may give quilting another chance. Looks like the book & cd even has stippling which is nice that I wouldn’t have to try to figure out how to add that. Wow! no more stress about getting the right colours pieces in order with the numbers already embroidered onto the stabilizer. And I love that the crazy quilt block has the traditional five sided starter piece. What a great idea for quilt blocks. I would love to know more about it and this book would do the trick. I have never seen this technique before and like the idea of it. Thank you so much for your ideas and for this opportunity to win this. My most stressful part is lying them all together and get them staight! My most stressful step in quilting is quilting it where it’s more than just straight line. I’m just starting to free motion and I’d love to be able to use embroidery for that part! The most stressful area of quilting for me is preparing the quilt sandwich for quilting. The biggest problems for me is sandwiching the layers together and then trying to quilt on a regular machine. I love to embroidery, and have an embroidery machine. Quilting on an embroidery machine would solve all of my problems! Choosing colors is one of the hardest decisions for me. I have time piecing so that everything looks the same. I have trouble with my sandwich quilt laying flat & smooth. Someplace always seems to bunch up. Keeping my stitches even is very stressful for me, along with deciding on a quilting design. My biggest struggle is not to lose my mind while trying quilt on my sewing machine. All of the bulk and moving things around frustrate me to no end. These techniques appear to take the stress out of the equation! I would dearly like to learn! The most stressful part of quilting is getting the blocks all the same size. Your blog about using my embroidery machine is spot on. Thank you. My most stressful part is trying to keep consistent stitch length and a nice smooth rhythm. Either stitches are too long or way too short. Would love to be able to quilt my tops this way. The free motion quilting is the most stressful part for me because it is what I’m the least skilled at and I don’t want to ruin my top. I’m ok with straight line quilting. Basting the sandwich is my least favorite thing to do! Anything about machine embroidery is stressful for me! Finishing the quilting is the most stressful part for me. Actually, I enjoy all the parts of quilting. I guess the most stressful part is choosing the fabrics–making sure they go together and that I have enough of each one. the actual quilting — love making the tops, but they stack up as I don’t like the quilting part. I find it stressful trying to keep the stitch length even when free motion quilting. I am not a quilter, but this looks like fun in making a quilt with an easy non- stressful way. The most stressful part for me is making the quilt sandwich correctly. Sandwiching the quilt is stressful for me.